Electric fence installation will benefit owners of small businesses (such as apiaries) and thereby promote human-bear coexistence. Mitigating conflict between wildlife and humans is often a critical issue when it comes to rewilding. 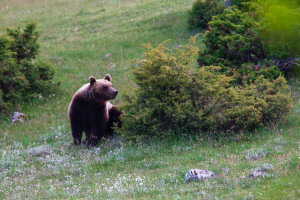 In the Central Apennines rewilding area in Italy, the Rewilding Apennines team and local NGO partner Salviamo l’Orso (Save the Bear) are installing small-scale electric fences to prevent conflict between Marsican bears and local farmers and beekeepers in corridor areas that are crucial to the bears’ survival. 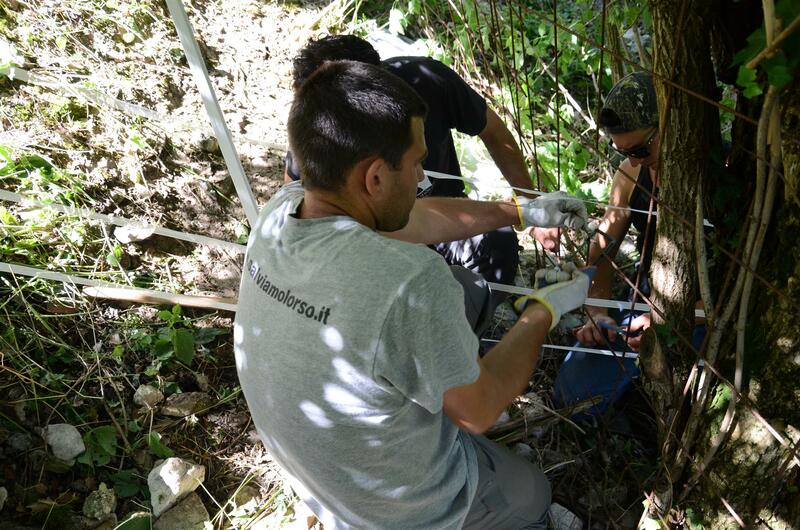 Members of the Rewilding Apennines team install an electric fence in a bear corridor. Focusing on livestock farms, orchards and apiaries, eight new electric fences have recently been set up in corridors between the Abruzzo, Lazio and Molise National Park, Sirente Velino Regional Park and Majella National Park. While some fence recipients had already experienced bear-related damage, others were simply taking preemptive measures given the presence of the animals in the area. Electric fences are distributed on the basis of reported sightings, which are then verified with surveys and monitoring. Some of these reports have come from quite unusual places and along corridors between protected areas, illustrating the importance of expanding the amount of territory where bears can roam safely. In the past few months a female Marsican bear with three cubs has been observed in Majella, offering hope that measures now being taken to conserve and boost the population of these magnificent animals are working. Preempting conflict with humans is critical to conserving and boosting the Central Apennines’ population of magnificent Marsican brown bears. Local people are becoming increasingly enthusiastic about the electric fences, which are installed on a free loan basis. Many have shown a sense of affection and attachment to these beautiful creatures, despite legitimate concerns over their presence. Today the 50-strong endemic Marsican brown bear population of the Central Apennines remains highly endangered. While the remaining Marsican brown bears are relatively safe inside the area’s national parks, outside park boundaries they at risk from poaching, poisoning and traffic collisions. Bear-related conservation work, which focuses on protected areas, has so far ignored the connections between them. The value of these corridors, so vital to bear survival, can be improved by involving local communities, mitigating human-bear conflict, and giving people economic incentives to protect the bears.